This is plate 18 from 'Sketches in Afghaunistan' by James Atkinson. The fear of growing Russian influence around India brought the British to the buffer state of Afghanistan. In 1840 they ousted the Emir, Dost Mohammed, from Kabul and replaced him with the pro-British Shah Shuja. 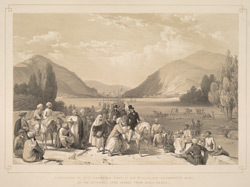 This view shows the road leading from the camp to Kabul in the valley of Qila-Qazi. It was here that Dost Mohammed suddenly gave himself up in November 1840. Atkinson wrote: "The road from Killa-Kazee is very confined, hemmed in by huge masses of rock on the left hand and dense groves of mulberry trees on the right." On Mohammed's surrender: "This event occurred while the British Envoy was taking his accustomed ride, attended by his staff, and totally unconscious of any intention on the part of the Dost, to surrender himself". McNaghten was political secretary to George Eden, Lord Auckland, Governor General of British India. He was convinced of the correctness of British fears over Russian intentions, and the necessity of placing Afghanistan under British tutelage.